The Reduta Theatre (Divadlo Reduta), is a theatre situated in Brno, Czech Republic. 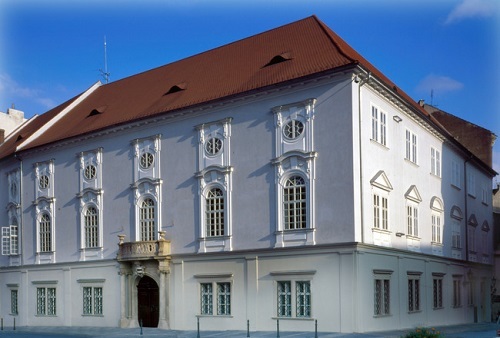 It is a part of the National Theatre in Brno and it is the oldest theatre in Central Europe. It was built on the city’s oldest square, Zelný trh and began its life as the Taverna Theatre. In 1767, Wolfgang Amadeus Mozart performed there with his sister Nanerl. In memory of this important event, a Mozart monument by Kurt Gebauer was unveiled in front of Reduta in 2008. Until 1919 Reduta was used by the Brno German theatre but from then on, it alternated regularly with the Czech National Theatre. The Czech audience had not been used to visiting Reduta very much and therefore the theatre became popular only after the end of the Second World War thanks to the then singspiel ensemble, which performed here until Reduta was closed for its alarming condition in 1993. The modern history of Reduta commenced on 1 October, 2005 with the first post–reconstruction performance – a joint project of the National Theatre Brno drama, opera, and ballet sections: Vít Zouhar’s Nights through the Day and Igor Stravinsky’ Soldier’s Tale. Today all ensembles of the National Theatre Brno perform in the building and a separate art section develops and implements Reduta’s overall concept and production. You can find the information about the ongoing concerts and tickets on its official website.